Mohamed HAMMADI is the Executive Managing Director of Walton Partners, management consulting firm specialized in recruitment and executive search services, and advisory solutions across finance, M&A, Fundraising, IT, corporate governance, restructuring, controls and logistics. 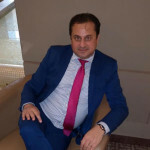 With over 20 years of experience in C level management and business operations on a global scale, Mohamed has worked all over the world and oversees the profitability and management of the firm. Prior to helping to co-found Walton Partners, Mohamed was the Chief Financial Officer for Arthur Bonnet Group Holding in Paris and Financial Director of GlaxoSmithKline North Africa. He has managed primarily large and multinational companies, and is seasoned in change management and multicultural and multidisciplinary workplace environments. Mohamed resides in Paris, France and speaks fluent English and French. Outside of his professional endeavors, he is an avid traveler. Bristol Who’s Who Member Mohamed Hammadi can be found on the Who’s Who Directory, where he is looking forward to networking with you.